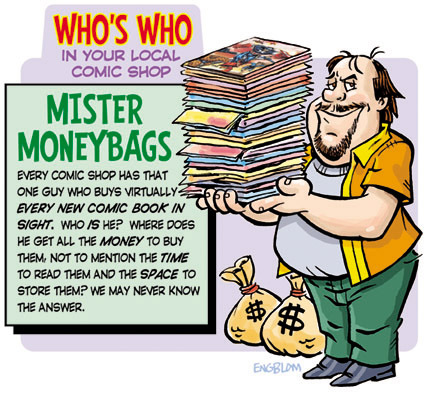 He approaches the cash register with a tottering stack of dozens (if not hundreds) of comic books without batting an eye, while the brains of stunned fanboys whirl with calculations and estimates of his comic book feeding frenzy! Truly, it's a devotion to comic books (and a bank account) that staggers the imagination! He works at the movie store , or subway or some other strip center type shop and he lives in his parent's basement/ attic/ garage. He has 2 friends, one of which has a girlfriend and together they play video/ role playing games. His entire paycheck goes to support his comic/ gaming habit. He is a walking lexicon, if you ever have a question like "Who wrote the Xanth series?" or "What is the life expectancy of a flesh golum?" Then he's your man.